A commonly held belief is that there is an essential distinction to be made between a person's head and heart. The head refers to what is propositionally held. The heart commonly refers to a more emotional component of human processing. If one holds to this kind of distinction one might come to the conclusion that the head and the heart could in some way conflict with each other. I have heard the distinction between head and heart in a multitude of contexts - "Don't let your heart rule your head!"... "I know it is right in my head, but my heart says..." ... "Just follow your heart!" etc. I hear it as a criticism of church, that it is "too head and not enough heart" or vice versa. Plato thought that human beings were made up of three parts, the reasoning part, the appetite and the will. He drew the conclusion that the heady, rational aspect, being the part that participated in reason (the non-material universal world of forms), should rule over the appetite and use the will to keep order. Metaphorically speaking, Plato thought that the philosopher should be king over the "grunts" and use the military to keep control (reminiscent of certain forms of government). There is another way to look at this. One might believe that human desire holds sway, that this, for example, is the location of our sin problem. Reason is what we use to justify our desire and action. Sin is dealt with not by the application of reason via the will to curb the appetite, but in the fundamental change of the appetite and will to desire God and will to believe in Christ for one's salvation. Having said all this, I am mindful of another question: on what grounds do we believe in such a distinction in the fundamental makeup of the human personality/character/nature? How do we know that human processing takes these distinct forms? It seems to me that it is an assumption worth taking to task. The particular area in which I think it deserves to be questioned is in the assumption that the head and heart can somehow "rule" over one another, that one can conflict the other and overrule the other. For example, consider the desire to eat pie that might be a little too calorific. The heart may say "eat" and the head may say "no." The common idea is that, as a result of some kind of internal struggle, one or other--the head or the heart--will win. The action is thus determined by the victor. If I do not eat the pie, I can claim that my head "beat" my heart. If, on the other hand, I do eat the pie, it is my heart that prevailed. Say I do not eat the pie. What do I say about my heart? Is my heart a wounded looser or does it have a corresponding joy in having overcome the desire to eat pie? The latter would suggest that in some way the heart shares the victory. Perhaps this is because the heart has not only been beaten, but has been won over to the side of the head. But then what can we say when it is the heart that wins? Do we have a corresponding rational justification for our eating the pie? In this case it is not so clear. The rational part might remain opposed to the eating of pie. Yet it is conceivable that a feeling of guilt is rendered upon the completion of the last bite. This appears to provide support for the head as rightful ruler. The head, after all, wins in some sense in either case. It either gets its way or it is able to produce a consequence to the action that nevertheless wins over the heart. All the while I merely assume the existence of the two parts, my head and heart. They remain unjustified. There is no way to know the make up of the internal constitution of the human person merely through introspection. Is it really the head and the heart? It appears possible to apply the assumptions of the second way of looking at it. That whether or not one eats the pie is always a determination of the appetite, the heart. 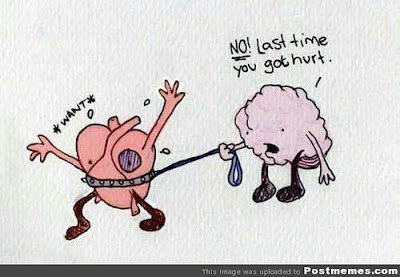 Then it would be impossible to say that the head ever really overrules the heart. This is because whatever action is carried out the action is carried out as an outworking of the heart. One might suggest that an action is sometimes coerced by external factors (one might be forced, at pain of death, to eat the pie), but that is not relevant. The point being made in the head heart distinction is that the heart and head are essentially different and it is possible for them to conflict. There is another lurking question. What exactly do we mean by head. It seems that most people mean something like "rational" or "logical." But how does logic relate to the human person? If this is the domain of the head, the head alone uses reasoning, then the heart is the non-logical part. But how can this be? It is not irrational to say "I want pie." In fact, the conflict appears to be between two desires of the heart - "I want pie" and "I don't want to gain 10 lbs." Both of these desires (supposedly of the heart) need logic in order to be known. Perhaps, then, reasoning is a matter of interpretation, an interpretation of the mysterious non-rational heart. But that doesn't seem quite right. What is non-rational cannot become rational. It might be unknown but if it is irrational it cannot change status to rational. And if the head alone contains the necessary rational apparatus (that is what makes it the head), then one cannot make the essentially non-rational heart intelligible through interpretation. Consequently, it does not seem that the heart can be the non-rational and the head the rational. Perhaps the division is more simple. Surely the distinction is not between what is rational and non-rational, but between what is emotional and what is non emotional. But this falls to the same problem as the former. What is it to say that thought is devoid of emotion? Is this possible? Can I think without feeling? Apparently not. Can the emotions conflict with the non-emotion? This is unclear. The Bible describes people in an altogether different way. On the internal division of a human being, the Bible does indicate that a person is made up of body and soul, but I'm not sure that helps. However, the use of the term heart, which we have been using to talk about feelings, is never divided from a rational part. In fact, the Bible uses the term heart to talk about the seat of the person, the will, rationality, feelings, personality and everything else that makes up a person all rolled into one term. Just spend some time reading what the Bible says about the human heart (here). The Bible describes the heart as being sinful and in need of cleansing: "Create in me a clean heart, O God, and renew a right spirit within me" (Psalm 51:10). The heart is deceitful and, as we know, is sometimes mysterious: "The heart is deceitful above all things, and desperately sick; who can understand it?" (Jeremiah 17:9). The heart can be broken and healed by God: "The Lord is near to the brokenhearted and saves the crushed in spirit" (Psalm 34:18). The heart can trust in God: "Trust in the Lord with all your heart, and do not lean on your own understanding. In all your ways acknowledge him, and he will make straight your paths" (Proverbs 3:5-6). The heart is capable of foolishness: "For although they knew God, they did not honor him as God or give thanks to him, but they became futile in their thinking, and their foolish hearts were darkened" (Romans 1:21). In my opinion, such a view of the heart--as the seat or center of the person--is a better use of the word and expresses a multifaceted personality rather than merely an emotion. It also avoids the stripping of human reasoning down to cold logic. Human beings were not designed to think like a computer. They were designed to think after God. That is to say as whole persons. Logic, in that sense, can be filled with emotion. Emotion is also not irrational, something to be conquered. It is integral to the human person. Can emotions get the better of you? Of course, but emotions, like reason, are not fundamentally irrational, unhelpful things, to be suppressed at all times. In fact, the Bible is filled with emotional outpourings. Just read the Psalms or the Prophets to hear the raw power of emotional writing. Love, a confused cultural concept in our time, is often stripped either of its strength by romantics or of its power by non-romantics. Love can be reduced on either side to sloppiness or to duty-bound sacrifice. The love of God is neither sloppy nor is it cold. It is steadfast, but no less felt. Despite our getting ourselves into the pit of sin, God is pleased in picking us out from it even at the cost of his Son! Worship is likewise an act that is involving of the whole person spell-bound in adoration of the one that saves and promises, One who is faithful, good, merciful and has drawn close to the undeserving. It is neither solely an act of emotion nor of reason, but essentially an act of the person from his, holistically speaking, whole heart. Can we be irrational. Most certainly. We are sinful, deceiving ourselves with lies, living according to the lusts of the flesh. But human beings are not half good and logical and half bad and irrational. Nor are we half good and emotional and bad and rational. We are wholly either favored by God due to his grace or wholly under his wrath due to our sinfulness. It is the whole heart that requires salvation, not just a part. Thanks for this clear and very important analysis. Good post on taking a popular misconception between the relationship of "mind" and emotions.